I said I was going to be serious about my blogging, and I like the accountability of NaBloPoMo. So I signed up for January. Really, I should have signed up for February- a nice short month! The theme is Best, and I welcome suggestions on “best” topics to write about. Looking back on 2009, I felt like I didn’t do much this year. But my goals for 2010 are to work on my strengths, read more books (that aren’t children books), exercise more, eat less, try new foods and make more friends. A wonderful 2010 to you all! The trees have been stripped, most of the gifts have been put in their proper places, and the Christmas guests have left. The high from Christmas has been ebbing as Geoff went back to work, and I began to turn the house back to non-Christmas mode. We were blessed with a good holiday. Even with having both kids & Nana get hit with a cold, everyone had a wonderful time. The kids are sad that both Christmas & grandparents are gone, as are we. I may spend the next few days reflecting over the year, but mostly I want to look ahead, eager to ponder what 2010 may hold. I tried my hand at Whrrling and this was what I got. but I am busy prepping for Christmas, entertaining my inlaws and trying to remember the true meaning of Christmas, that I just haven’t found time to wish you all a Merry Christmas. I married a man who has an ornament that say “Official Believer In Santa”. The man’s blood runs red & green. He loves Christmas. And this has naturally carried over to our two boys. Everyday, the boys ask if it’s Christmas yet. They count the days on the advent calendar at least twice a day, to be sure that they haven’t missed something. They ooh and ahh at holiday lights. We have not yet visited The Man In The Red Suit, but Elijah and Miles have told us what they were thinking of asking him for. Miles would like Presents, and Elijah, “whatever Santa brings me”. The anticipation is building, and will likely crescendo when Nana & Grampy arrive on the 20th. We have told the boys, this will signal Christmas is even closer. Add to that, we’ll be getting another Christmas fanatic (Grampy). It’s gonna be a loud Christmas! When we first moved to Denver, our apartment was in a small area called Glendale. We loved being so close to a bike path that led to Cherry Creek Mall. We would walk there often, taking in the stores the mall offered as well as the shops at Cherry Creek North. Our favorites of CCN were Tattered Cover (which has since moved), Kazoo toy store and Peet’s. Smaller shops closed down due to high rents, and chain stores like Crate & Barrel moved in. Still we appreciated the area, especially the Cherry Creek Arts Festival, held every July. Last night on the news, I was dismayed to find out that Cherry Creek North is planning on having close to 6 medicinal marijuana shops open up in the near future. This is not what I wanted for a place that I take my children. With a business like that, you are bound to attract more crime, as well as people there who certainly don’t need drugs for medicinal purposes. Frankly, I think my days of supporting the stores in Cherry Creek North have ended. I can find Peet’s & Crate & Barrel at other shopping areas, and as for the independent stores I will seek out new shops. Cherry Creek North-thanks for memories. I was fortunate enough to go see the production Spring Awakening on opening night here in Denver. I was completely blown away! The Buell Theatre in Downtown Denver is a lovely performing area. The stage was fairly sparse, save for some bleachers and chairs. Some lucky audience members were seated in the bleachers, making me wonder what the show would be like from that perspective. The back wall was adorned with mirrors, photographs and artwork. Also at the back of the stage was the band. It was a pretty full house and then the cast took the stage. Those actors not in the scene sat on the bleachers, interspersed with the audience. The voices rang out and the energy from the performers let me know I was in for a real treat. The music was likely my favorite part of the whole show. The rock songs took this play and gave it life. A play about sexually charged youth, filled with angst and confusion, I felt like I was going through their pain with them. Everyone was wonderful, but Moritz really shined (in mine & Geoff’s opinion). When Moritz sang, “I don’t do sadness”, I was able to reflect back on how I felt as a teenager. The other part of the show that had me captivated was the lighting. That may sound weird to you, but for me it helped convey the emotions of the music & scene. I would totally go see this musical again in a heartbeat. While there were a few moments that made me uncomfortable, there was nothing offensive in it. I think one of the goals of the people involved with this project was to use the musical as a catalyst to get parents & teens talking. While these youth were surrounded by adults unwilling to address the realities of being hormonal teens, we (parents, teachers & clergy) need to be available as a safe place to come to with concerns. If I walk away from seeing this with at least being that kind of parent to my boys, then maybe I can save them some of the heartache that comes with growing up. 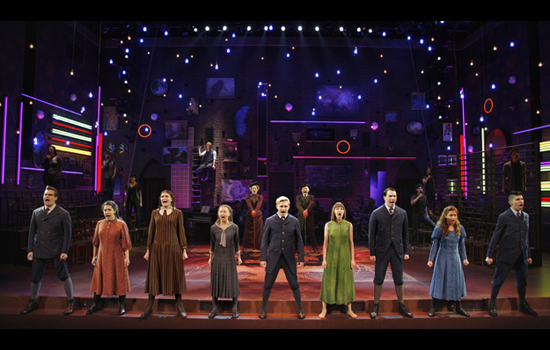 I highly recommend Spring Awakening! Visit their website for more info. Wow. I didn’t think I’d be able to finish NaBloPoMo. And here, 30 days later, I’m writing my last post. 1. It’s hard. It’s hard to write for 30 days straight. It’s hard to make time. But I wanted so very much not to be a quitter. 2. It pays off. I got at least one new reader-so hopefully she’ll keep on reading and my readership will grow. Yes. So long as it doesn’t begin December 1st.